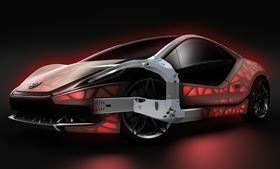 The Light Cocoon concept car, featuring additively manufactured nodes in the vehicle structure. The car, called the Light Cocoon, features additively manufactured bodywork nodes which can be configured to be more flexible and multifunctional so that different versions of a vehicle can be produced on demand without any additional tooling, equipment and start-up costs. The nodes can be made on site for the particular version just in sequence (JIS), and can be adapted to reflect each load stage, e.g. by incorporating additional stiffening elements to cater for high load requirements, the company says. This means that each version can be designed for the best weight and function. The company made use of its LaserCUSING 3D printing process which generates components in layers directly from 3D CAD data. The nodes were made on an X line 1000R machine which has the appropriate build envelope (630 x 400 x 500 mm3) for such projects and operates with a 1kW laser. Accorfidng to the company, the type of design meant that the nodes could not be manufactured by conventional steel casting. This story uses material from Concept Laser, with editorial changes made by Materials Today. The views expressed in this article do not necessarily represent those of Elsevier.